Moosehead Kitchen-Bar at Telok Ayer Street introduces a refreshed dinner menu with add-ons inspired by global street food. Keeping its Mediterranean roots, Chef Seumas's dishes continues to showcase the characteristics of the produce while working closely with other local and global flavours. 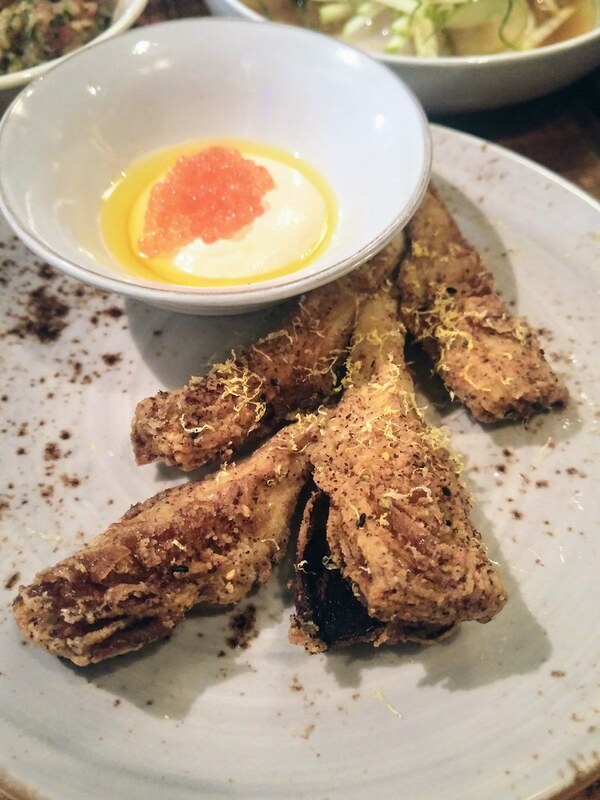 Fried artichokes ($12) features Taramasalata, a Greek meze made from tarama (salted and cured fish roe). Bread is being ground into a starchy base and mixed with olive oil, lemon juice to form an emulsion. Looking very much like hummus but with a finer texture. with a hint of brininess. I'm not that enthused towards the fried artichokes, which has been stripped of its natural flavours. You may however, be delighted by its airiness. I reckon substituting with something else to enjoy the moreish dip will be just as satisfying or more. 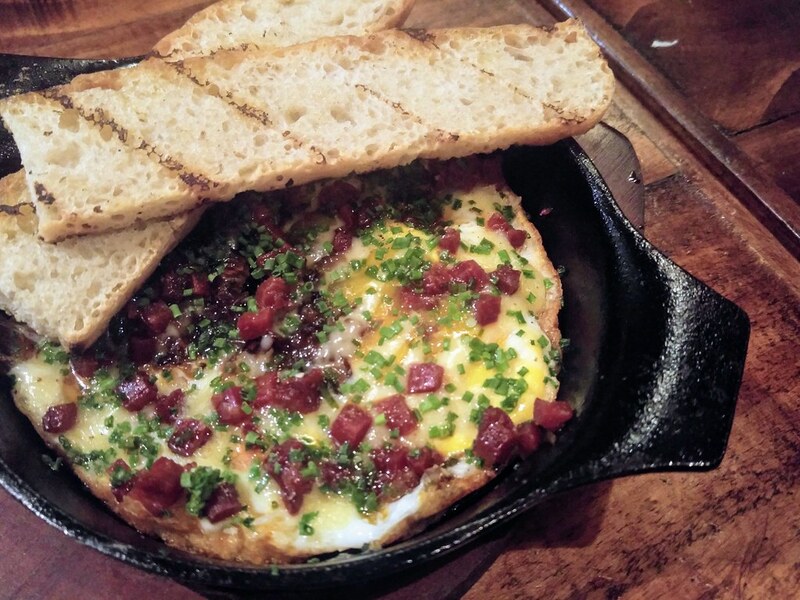 INKA Fried Eggs ($12) is a comfort food tagged with a fancy name and style. Compacted like a pan-pizza and studded with highly flavoured diced chorizo, it was like having a big breakfast without having to go through the trouble of cutting out the sausages. The best part is when you slice through the pan-eggs and seeing the half-set egg yolks oozing out. Wasting none of that, this is when the charcoal-toasted sourdough comes in, while loading the dish with another layer of smokiness. The chorizo can get a tad too salty at some point but the aioli alleviates that with its tangy sweetness. Deviating from its Italian self (green, white, red), Burrata ($21) takes on a new all-green look (which I really love) with a notable Southeast Asian identity. 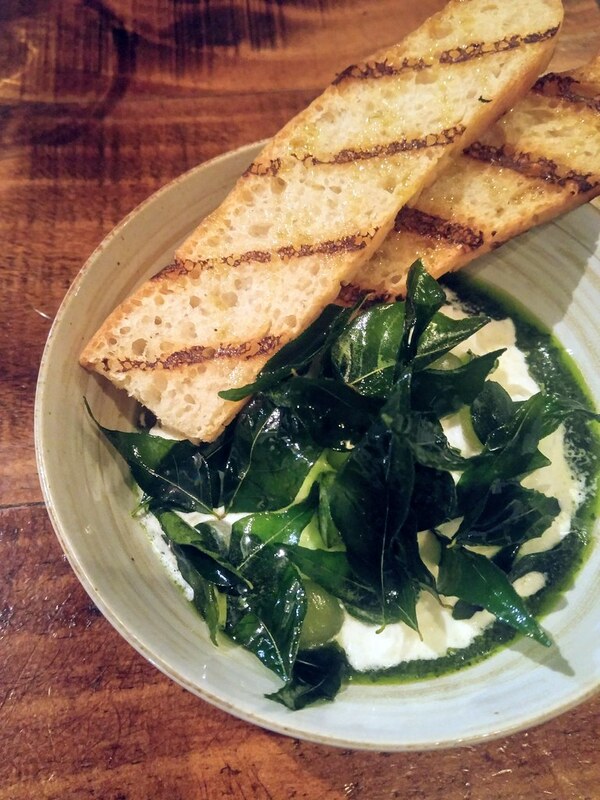 To highlight the subtle milkiness of the burrata, the acidity comes from home pickling the zucchini and intensifying the Genovese-style pesto with Thai basil, which creates a stronger juxtaposition of flavours. The creaminess of the cheese came through fully as I bit through the sharp sautéed curry leaves. The Octopus ($30) with fried potato, red pepper puree and paprika serves as a more playful dish compared to being served in its original form, which is the entire tentacle as presented previously. Street food it is, as you can conveniently scoop it into your mouth with a spoon. 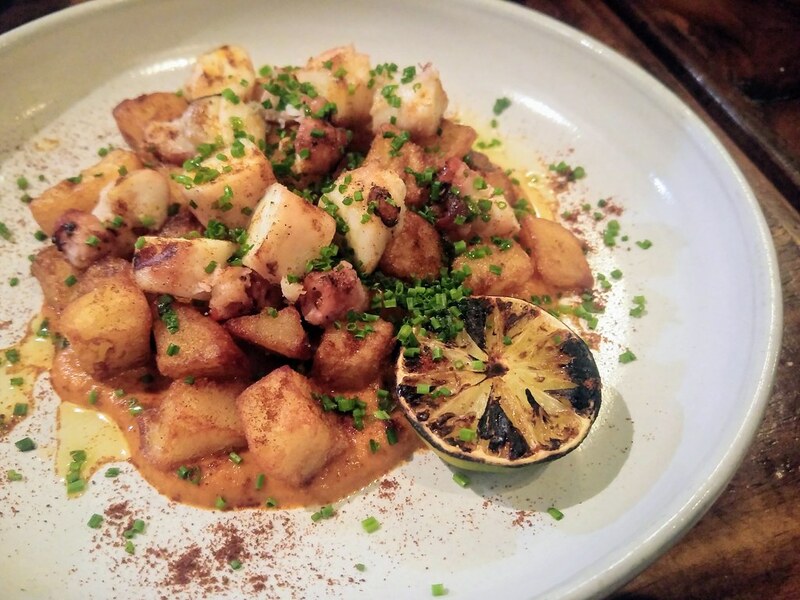 The firm and chewy texture of the diced octopus mingles well with the fried potato, which is a star in its own right with its crispy edges and a texture that's very much like potato tots. What binds the ingredients together is the stunning orange-red red pepper puree, that adds zing and complexity to the entire dish with its blend of spices, capers and Semillon vinegar, along with a hint of smokiness that permeates throughout. My favourite of that evening is none other than Hokkaido Scallop Crudo ($21). An outlier I called it. Ponzu-marinated, the muscles of the Japanese scallops seemingly had relaxed and softened as they almost melted in my mouth. 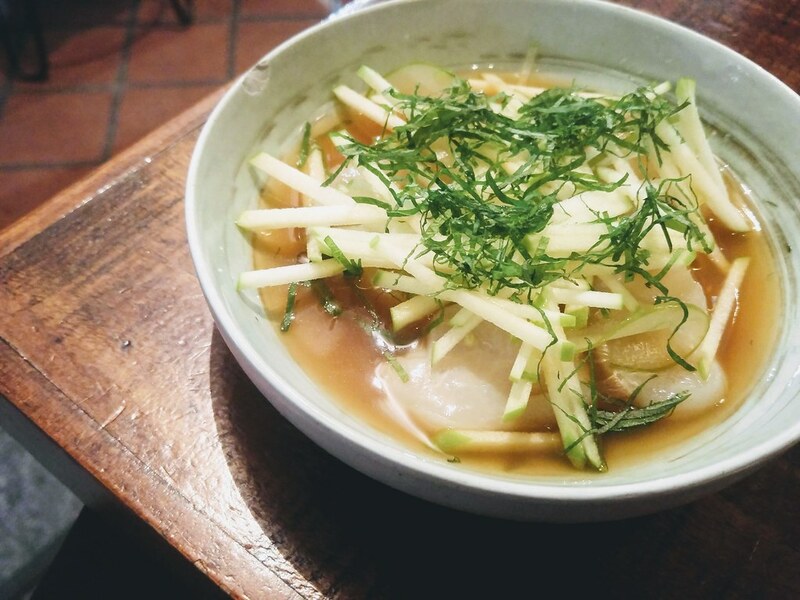 Paired with apples pickled in housemade verjus, which is less acidic than vinegar, and sweet and tart like white wine, the savoury and sweet flavours of the scallops come right through. Wonderfully refreshing, an apt dish to be served just right before my main. 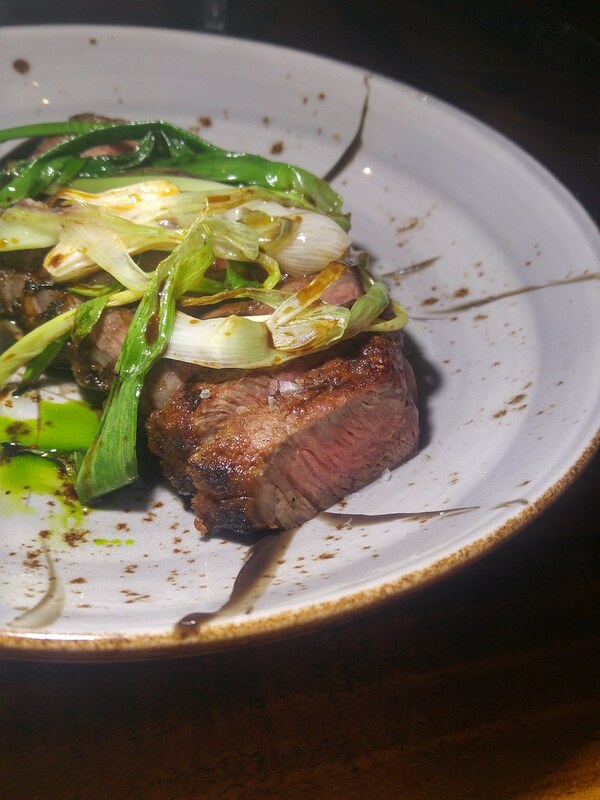 Our main is a sharing portion of O’Connor Beef Sirloin ($62). 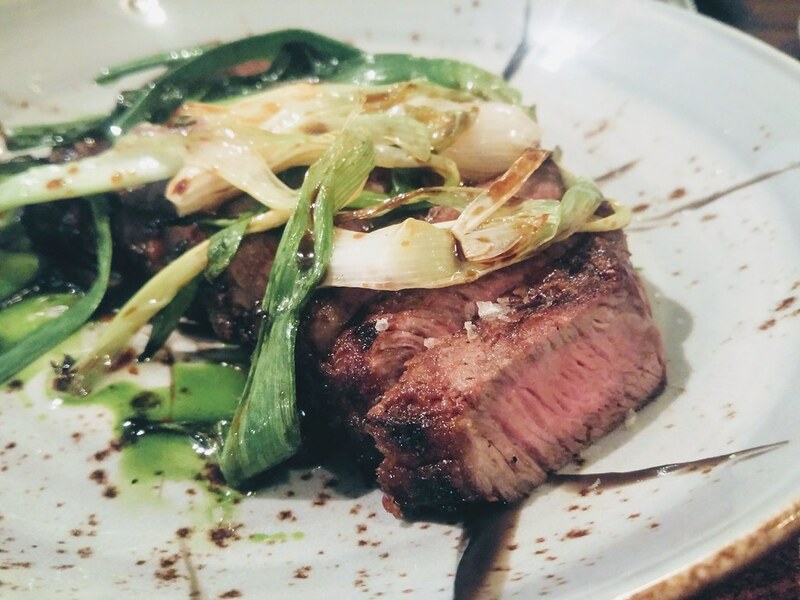 A hefty 300 grams of meat served with mushroom ketchup and roast spring onions. What's notable in this dish is the mushroom ketchup, which is a result of a rather painstaking process before getting that limited amount of mushroom reduction onto your plate. My taste buds felt overwhelmed after a while. Personally I do find some of the dishes too heavily salted. Fortunately, the desserts that were being served brought my senses back. The Chocolate Mousse ($10), dark and dense, is complemented with a scoop of mellow vanilla ice cream. 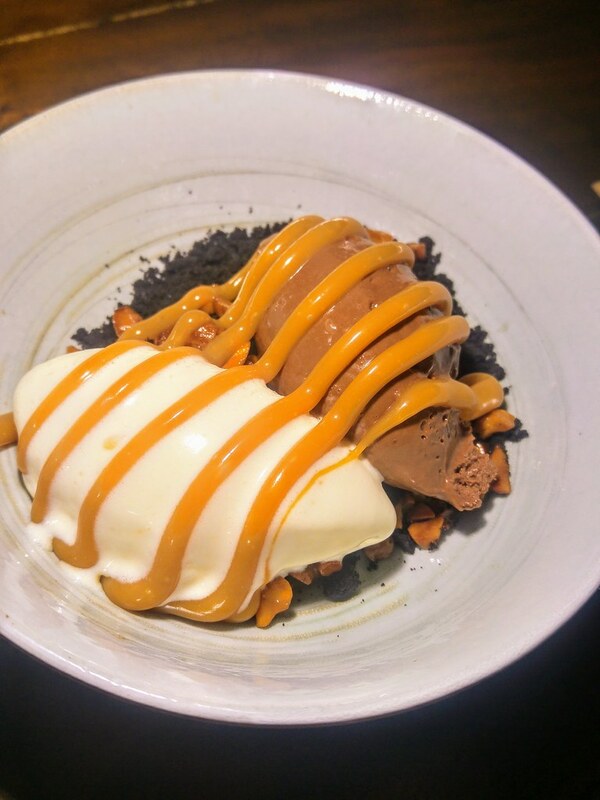 What makes it delightful is not just the salted caramel drizzle which everybody likes but also the addition of crunchy peanut clusters that are being buried in the crumbly chocolate soil, delivering sweet-savoury notes that builds on the creamy-crunchy textures. 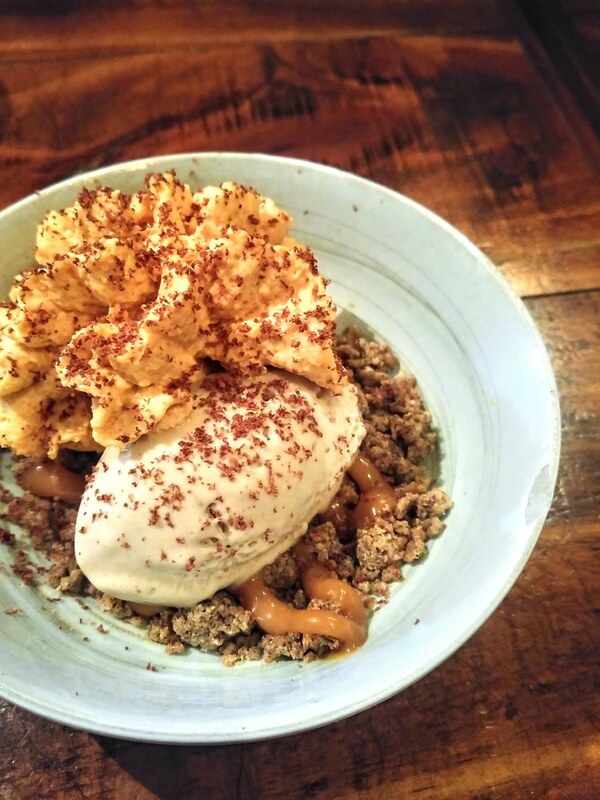 I was more intrigued by the Banana Ice Cream ($10) made with Inka-roasted bananas blended into a housemade egg-based ice cream. I love the idea of churning the salted caramel into a foam, which allows its flavour to be spread evenly across. I didn't quite feel Moosehead has made a statement as much as my very first visit. But the complexity of the dishes still shines, not to forget the upbeat ambience of this small space. Perhaps that explains the crowd day in and out.